Before Aaron and I went on our 16 day adventure to Europe, we had never been on a flight longer than three hours. It's safe to say that the eight hour flight to Dublin and eleven and 11.5-hour flight home from Rome had us a bit nervous. But we did our research, made a few key purchases, and ended up handling the flight- and the jet lag- like champs. 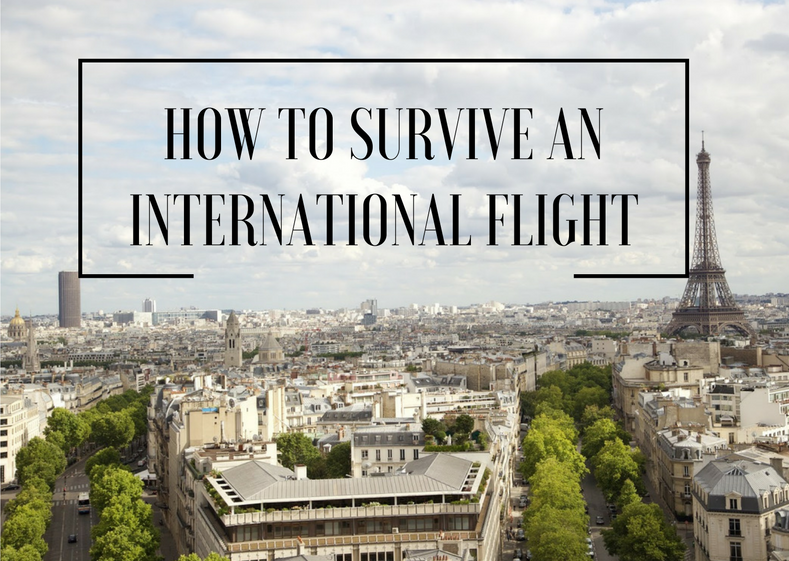 Here's how you too can survive your overseas international flights with ease. Do you have certain health conditions that would make the flight extra uncomfortable or difficult? Does the airline you plan to take offer free earplugs, pillows, and blankets like most do these days? How many times will they feed you? Do you need a special meal? If so, you'll have to contact the airline directly and let them know. Ask friends what overseas flight items they have that you could borrow instead of purchasing your own. Try them out on your first overseas flight, and then you'll know what to buy for your next adventure! Purchase necessary flight survival items. Overseas flights almost always involve flying during sleeping hours. Make sure you have a good eye mask and earplugs that will block out sound and light since planes and the people on them are noisy. Consider getting a great neck pillow as well, especially if you're not flying in first class. You'll thank yourself for the support later. I recommend using packing cubes to help you fit as many items into your suitcase as possible. We prefer traveling with carry-ons only so that we can get on and off of flights easier without having to worry about checking baggage or losing it. Dress comfortably, and in layers. Planes always fluctuate in temperatures, so it's best to be prepared for any scenario. I love traveling in a comfy pair of stretchy leggings and a shirt and cardigan. This way, I can move my legs around in a variety of positions, and can take the cardigan on and off as needed. I also wear slide-on shoes that are easy to get on and off during security, but I wear a pair of socks so that my feet won't get cold when I take my shoes off during the flight. I didn't expect the food to be anywhere near as good as it was on all of the overseas flights we've been on. They feed you quite often. If you aren't hungry for any of the meals, save things in your small personal bag for later, and be sure to accept a drink every time they offer. Though it might make bathroom trips annoying, it will help keep you from dehydration. I can't emphasize this one enough. Even though your body may not feel like it, try to make yourself turn off the free movies and games and make a concentrated effort to sleep. Put on your eye mask and put your ear plugs in, and at least rest. It's pivotal that you sleep on the plane while you can to help deal with jet leg. The only exception to this is when you come home, as the time change may help you if you stay awake a little longer. Get up and take walking breaks. This is even more important if you are pregnant or prone to blood clots. No matter your health conditions, getting up and getting your blood flowing every few hours is never a bad thing. I usually take a lap or two around the aisles before and after I use the restroom. Stay on the schedule of the time zone you're in. It can be incredibly hard to want to stay awake in Europe when your body is telling you it's 4 a.m., but trust me, you've got to try to acclimate to the correct time zone as quickly as you can. Make it through that first day, and then you'll sleep like a rock. Also, eat when the time zone says you should be eating. Don't overbook your first day. You'll be fighting that jet lag hard, so allow your first day to be a little less busy than some of your other days. Instead of a walking tour, ride a train or trolley. Spend a little time at the cafe' sipping coffee. And then book a nice hotel room for the evening, and let yourself go to bed a bit earlier than normal. Your body will thank you! That's it. Be sure to plan ahead for your flight, eat and hydrate, get up and go for walks, and you'll be just fine. Jet lag really isn't all that bad if you can make it through that first day! Best of luck. Let me know if you have questions or need advice! These are all fabulous tips! I studied abroad in London this summer, meaning I had to endure a couple of really long flights. I totally agree with staying on the schedule of the country you're going to (gotta avoid that jet lag!) and eating/drinking whenever it's offered. Oh definitely! I has made a huge difference for us! Great tips! I've traveled abroad more then a few times and can definitely day these are spot on! the walking breaks would be huge for me. I do so much walking around during the day that to sit for so many hours would be killer!! I like the idea of borrowing vs purchasing for your first time, that's an awesome idea! Yes, for sure! It can be brutal. Borrowing is always great! Great tips! Walking breaks are important. I wish there was more room to stretch out - sleeping's always tough! Amen to that ha! I know what you mean. Thanks for reading! Ha! I love that. Hope it went well! I've flown between Asia and the USA a good dozen times--man, those flights are rough! Particularly when you take the cheapest flights, like I do, and don't even have any entertainment in the back of the seat! :P Movies help, for sure! I actually always pack a light blanket in my carry-on because I find airplanes crazy cold, and the blanket helps a lot with feeling rested and comfortable. Of course, it's also important to wake up, stretch, and walk around the airplane every couple hours to help prevent blood clots. I definitely pack snacks, too, because I've never met any airplane food that actually tasted good. That sounds rough for sure ha! No entertainment would be really hard! Blankets are great help. The food is really good on a little bit more pricey flights, but snacks are always a good idea ha! These are great tips! My longest flight has been like 5 hours so I haven't experienced any of this. Will have to save this for when I actually do take a long flight! For sure! When you get up to 8 plus hours, it changes things! Great tips! I've only flown internationally once, to Japan, but these are all great things to keep in mind. I was in high school and didn't think to bring a sleep mask or neck pillow. That would have made the trip so much better! That's awesome!! The sleep mask and neck pillows are lifesavers. All great tips!! I've flown internationally twice. Wearing comfortable clothes is a must! Also having entertainment is important. On both of the flights I took I slept as much as I could. I was still jet lagged but sleeping helped a lot. Great tips Kelsie! Definitely good points about the time zone and your first day! Thanks, Rachel! Those are always key for me! Great tips! I definitely concur on all of these. Especially the neck pillow and sleeping. My FIRST trip to Europe I opted to stay awake the ENTIRE 9 hour flight to Paris...and then it was morning there when we landed. HA. Needless to say, I spent a good part of my first day either miserable or napping. Oh man, that would be rough ha! Thanks for reading! What a great post. I remember my first (and only) international flight to Jamaica and even I thought those long hours were horrible! For some reason I just can't sleep on a plane. Thanks, Chelsea! It can be hard for sure.